Dimensions (HxWxD): 1.7" x 0.45" x 0.45"
This 40 carat Gemmy Aquamarine Slim Rod from Gillgit, Pakistan is just the right size to place in your hand during meditation and to carry in your medicine bag. It is a lovely pale clear aquamarine blue, with good color & clarity & very few inclusions. It has an incredibly beautiful termination point. 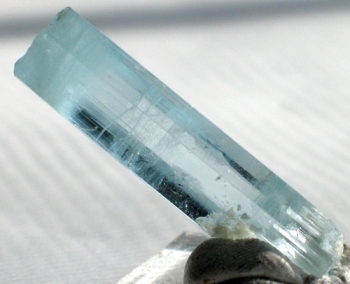 Aquamarine is an excellent stone for communication and is called the "stone of courage". Aquamarine is a very helpful stone in the beryl family, used for protection and spiritual connection. Aquamarine provides an energetic shield for our lightbodies. This semi-precious stone assists us to assimilate new knowledge while remaining true to our own highest nature. Aquamarine helps judgemental people to become more tolerant by reinforcing the connection with the Higher Self while clarifying mental activity of all kinds. It is a stone which encourages flow, balance, protection & clarity, attuning us to spiritual worlds while enhancing the connections between our intellectual, emotional and spiritual bodies. Aquamarine stimulates, energizes, and cleanses the throat chakra, facilitating communications activities of all kinds, and strengthening the connection between the throat chakra and the third eye chakra, infusing our communications with the wisdom and love found in the Higher Self when the third eye is fully activated. 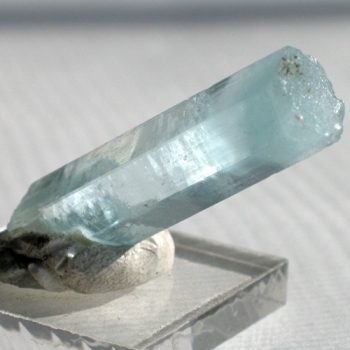 Because of its unique property of activating the throat and third eye chakras and clearing the connection between the two, aquamarine is said to infuse the user's mind with the ideal of service to the world, and to help the user develop a strong commitment to furthering the spiritual development of all humanity. Lightworkers will want to place this stone on their client's throat chakra during energy treatments to facilitate mental acuity and energize the individual with the courage to speak their own truth. We know you will use this powerful crystal with loving wisdom and respect its long journey in the Earth that has lasted for many long historical cycles. This crystal is a love-gift from the Divine Mother. Note: Actual weight is 8 grams or 40 carats.